It has been argued from time to time that humans being are capable of transforming from being bad to good if at all the necessary interventions are put in place to anchor such a transformation. 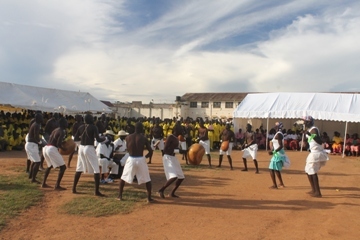 For close to a month, inmates from the units mentioned had been practicing to compete in the first ever Uganda Prisons Interstation music and dance competition and the impeccable display on a bright Tuesday morning was a clear testimony of the hard work they had invested in preparing for the competitive musical activity. Whereas Upper prison Boma won the competition, a panel of judges from Kyambogo University Department of Performing Arts conceded that deciding the winner from the five competitors was an uphill task given the quality of music and dance displayed by the five competitors. In his speech, the guest of honour the Deputy Commissioner General of Prisons called upon the inmates to use their time in prison profitably by learning different life skills. 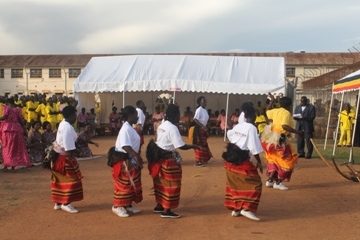 The occasion equally witnessed the launching of the Uganda Prisons Service Performing Centre by the Deputy Commissioner General of Prisons .The cardinal aim of the centre is to train inmates in various music dance and drama skills with the aim of preparing them for employment in the entertainment industry upon discharge.